The Food Institute's annual Mergers & Acquisitions report tracked 591 deals, most of them involving small, niche and artisanal brands. Food industry mergers and acquisitions neared a record in 2017, but in most cases the emphasis was on "small." M&A activity reached its highest point in more than 15 years, according to data tracked by The Food Institute. Total deals for the year climbed to 591 (including those not closed), moving well past 2016’s high of 505 deals, but still under 1999’s record 813 deals. Mainline food processors took part in 191 deals in 2017, a 34 percent increase from 2016. Cargill, Nestle, Premium Brands Holdings and Unilever were the most active companies, together making up 12 percent of the acquisitions. There were some big deals. Campbell Soup acquired Snyder's-Lance for $4.9 billion. McCormick & Co. won a public auction of Reckitt Benckiser’s food business (primarily French's mustard and Frank's Red Hot sauce) for $4.2 billion. Also carrying a $4.2 billion pricetag was Tyson Foods’ acquisition of AdvancePierre Foods Holdings. But no eight-figure blockbusters. Much of the activity involved big companies buying or buying into small, niche and artisanal brands. Unilever, which recently has been offloading food products, returned to buying in 2017 acquiring specialty condiments maker Sir Kensington’s, organic herbal tea producer Pukka Herbs, natural and organic food business Mae Terra and the Tazo tea brand from Starbucks, as well as investing in meal kit startup Sun Basket. Other processors employed similar strategies. General Mills' $8 billion purchase of Blue Buffalo pet food company is a 2018 deal, so not included in this report. Big G's food incubator 301 Inc. invested in healthy snacking startup D's Naturals and acquired a minority stake in Purely Elizabeth. Campbell Soup Co. acquired Pacific Foods. Cargill invested in labgrown meat producer Memphis Meats. Conagra Brands, also back in buying mode after a few years of shrinkage, acquired snack makers Thanasi Foods LLC, Bigs LLC and Angie's Artisan Treats. Dean Foods invested in milk alternative producer Good Karma. Hershey Co. acquired Amplify Snack Brands. And Nestle acquired Chameleon Cold-Brew, meatless frozen food maker Sweet Earth, and stakes in Blue Bottle Coffee and healthy ready meals group Freshly. The exhaustive report can be ordered online at food1.co/mergers2017 or you can contact April Brendel at 201-791-5570 x 218 or april.brendel@foodinstitute.com. 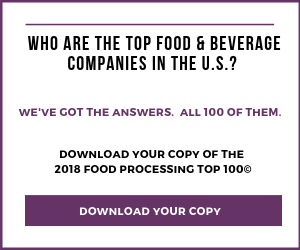 Top 100 Food and Beverage Companies for 2018: A Return to Topline Growth?